The perfect tool for centering, aligning and making accurate mortise cut's every time. 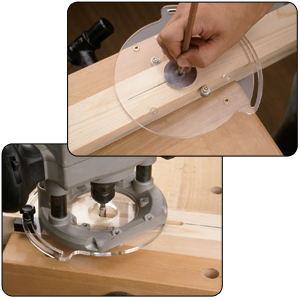 The router mortising plate allows you to make mortise cuts in stock up to 41/2" wide. Two metal guide rollers are adjustable and are to be set-up to ride firmly against the stock on both sides to prevent any movement of the router. The guide block can be maneuvered anywhere within the semi-circle slot for stability when cutting. The plate also includes a guide pinpoint, which works with a pencil for marking the center of the stock as seen in top image.